For the karate ka (or student) it doesn’t get any better than this - direct teaching from genuine Japanese karate masters. 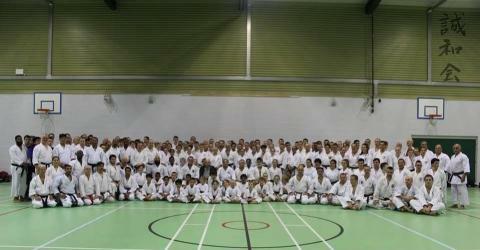 Last weekend Seiichi Fujiwara Hanshi, head of Sewakai International, and Satoru Takahashi Hanshi, both eighth dan karate masters, flew into the UK for literally three days to give their only European seminar this year at Bishop Douglass Secondary School in North London - a rare event that attracted students from as far away as Russia, Italy and Czechoslovakia. Despite numerous language barriers among the students, all eyes were glued on these experts of Goju, a style of karate suited to close up fighting, as they put the two hundred attendees through their paces. All ages and grades were present, from seven year olds to those pushing seventy, from yellow belt beginners to high dan grades. It’s a tribute to the quality of teaching delivered that Fujiwara and Takahashi were able to seemingly effortlessly command the vast sports halls they taught in, and have their diverse students rapt in attention for twelve and a half hours of study over three days. Beyond clear teaching points around kata technique and fighting application karate has many surprising lessons, if you take the trouble to observe. Take the concept of the master and the things we can learn from it. At a first casual glance a master generally appears like a little old man, and yet he is the most dangerously capable adult within the room -but he is more than a great exponent of fighting technique. Put simply a karate master is someone who has dedicated nearly their entire life in pursuit of perfecting their practice of the martial art. To get to their level takes decades of consistent and hard work. More than merely an outstanding practitioner, they are also capable teachers, carefully nurturing others along the path of their expertise with dedication and devotion. Necessarily of an advanced age, they have great value to those that are younger and are respected accordingly. From observing Fujiwara Hanshi and Takahashi Hanshi at work in London this weekend, lessons can be drawn about issues of age within our society and what it takes to be valued and have a valuable, indeed crucial, part to play when old. Two things can be learned. The first is that when younger, one should take up a complex timeless pursuit (anything from cooking to playing an instrument) that has value to oneself and to others, and then take the time and trouble to deeply learn and become expert at it. Notice the phrase ‘complex timeless pursuit’ – it’s no good choosing something that will have become obsolete in a few decades, as no one will want to take it up and be taught it, and it’s no good taking up something that can be quickly learned as there won’t be much of value to pass on. Secondly, learn to teach what you are studying and become as equally a great teacher as you are a practitioner in your chosen field. Become a nurturer of others along the path you yourself are treading. Our society does not encourage enough of us to do these two things, with the result that many face a redundant old age. But more than this, those that are younger are denied a pathway for living and a valuable resource from which to learn. Karate masters can teach us all so much more than karate, and in our own ways we can all follow in their footsteps.